Why Do Healthy Oceans Matter? Like generals planning for the last war, oil company managers and government inspectors tend to believe that because they survived the 2010 BP Deepwater Horizon oil spill, they are ready for all contingencies. Today they are expanding drilling into deeper and deeper waters, and the Trump administration is opening more offshore areas to production. In fact, however, the worst-case scenario for an oil spill catastrophe is not losing control of a single well, as occurred in the BP disaster. Much more damage would be done if one or more of the thousand or so production platforms that now blanket the Gulf of Mexico were destroyed without warning by a deep-sea mudslide. Instead of one damaged wellhead, a mudslide would leave a tangled mess of pipes buried under a giant mass of sediments. It would be impossible to stop the discharge with caps or plugs, and there would be little hope of completing dozens of relief wells to stop discharge from damaged wells. Oil might flow for decades. This scenario has already occurred, and we are seeing the results at a well off Louisiana, owned by Taylor Energy, that has been leaking oil since 2004. Based on this disaster and my 30 years of experience studying deep-sea oil and gas seeps, I believe that regulators and energy companies should be doing much more to prevent such catastrophes at other sites. The mudslide that caused the Taylor Energy leak was not an isolated event. Many major features of the Gulf of Mexico’s continental slope – where the sea bottom descends from the continent’s outer edge down to the deep ocean floor – were formed when that slope failed. Their bathymetric contours show unmistakable signs of massive mudslides in the past. Despite generations of oil production, the sedimentary strata of the northern Gulf of Mexico still harbor billions of barrels of oil. The modern, loose material that lies atop these rock layers is also susceptible to failure, which generates a phenomenon known as turbidity currents. These are massive avalanches of sliding material partly suspended in water, which can travel for miles with astonishing speed. One of the most famous turbidity currents occurred in 1929 following a 7.2 magnitude earthquake centered near Newfoundland’s Grand Banks. The resulting slide displaced over 40 cubic miles of material, traveling at 50 miles per hour for up to 300 miles. In 2004, storm surge and monster waves from Hurricane Ivan initiated the huge mudslide that destroyed the Taylor Energy platform, an aging facility called MC20A, located about 12 miles off the Mississippi River’s Birdfoot Delta. Company engineers claim it had only three flowing wells before it was toppled. Its wells were equipped with subsurface safety valves that were reportedly closed off when the platform was evacuated ahead of the storm. These valves apparently failed, because miles-long oil slicks have been seen on the waters above ever since the 2004 mudslide. Despite years of effort and expenditure of more than US$230 million, oil is still flowing from beneath the legs of the downed platform at a magnitude I estimate to be at least 100 barrels per day. 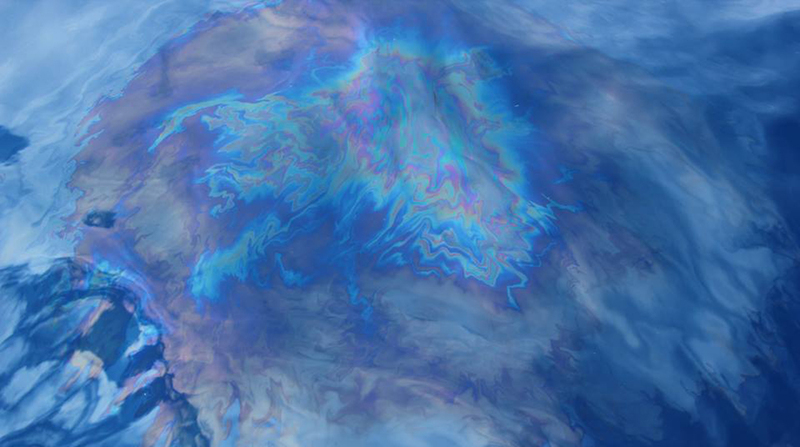 This event is the longest oil spill in U.S. history. In deeper waters, modern platforms are specifically designed to resist hurricanes. However, earthquakes also occur in the northern Gulf of Mexico. The National Earthquake Information Center had recorded eight earthquakes in the region prior to 2009, with magnitudes ranging from 3.2 to 5.9. On May 6, 2018 a magnitude 4.6 event occurred at a depth of 6,500 feet. Newer versions of subsurface safety valves on these platforms are intended to protect automatically against storms or ship collisions. Mudslides generated by earthquakes represent forces on an entirely different scale. Once a flow starts, it could travel for tens of miles, producing an unstoppable wave that would destroy whatever platforms and pipelines that lay in its path. Modern deepwater oil and gas platforms dwarf Taylor Energy’s MC20A platform in every respect. They are located 100 miles or more from land in water 10 or 20 times deeper. Typically, platforms service a hub of pipelines and robotically controlled structures connecting scores of wells from other oilfields that can be 25 miles or more distant. They are designed for peak production rates of 100,000 to 200,000 barrels of oil per day. How a deep-sea offshore drilling rig works. How should planners prepare for this hazard? A 2007 Interior Department study analyzed the danger and proposed guidelines for assessing risks to platforms and pipelines, starting with studies to identify areas of steep or unstable bottom. The agency recently released a digital map of the northern Gulf of Mexico’s deeper waters that shows evidence of past mudslides with graphic realism. Slope failure and turbidity currents are truly part of the gulf’s nature. Ironically, however, the map doesn’t cover areas closer to shore. Our most comprehensive survey of mud deposits offshore from the Mississippi Delta dates to the 1980s, but over the last 40 years development and dredging have accelerated sediment loss from the Mississippi Delta. This near-shore sediment load represents a looming risk, much like snowpack in avalanche country. The Mississippi Delta region of the Gulf of Mexico is crisscrossed by hundreds of miles of oil pipelines and dozens of still-producing oil platforms. As the 2007 Interior Department study showed, these structures are at risk for hurricane-generated mudslides. Obtaining updated survey information using modern methods should be a top priority. There are ways to assess risks in deeper areas as well, including zones such as the Atlantic coast where the Trump administration wants to expand offshore exploration and eventual oil production. This coast is also characterized by submarine canyons formed by turbidity currents. Oil companies spend billions of dollars to install and operate offshore platforms, but typically resist requests to use their infrastructure for monitoring the marine environment. If they could be induced to cooperate, one option would be to install networks of ocean bottom seismometers to listen for earth movements that might signal risky instability. These systems could transmit data back to land over the platforms’ high-speed communication systems. Platforms could also be used to monitor the heat content of Gulf of Mexico waters, surveying for conditions that promote the rapid intensification of hurricanes. In my view, U.S. regulators and energy companies have not paid enough attention to hidden vulnerabilities and long-term risks across our fossil fuel economy. But addressing this issue could produce real benefits. Conducting studies to identify unstable slopes will improve our understanding of the seabed. Monitoring for critical warning signs of storms will help coastal communities prepare. Better technology can make offshore infrastructure more durable, and informed regulation can make the offshore industry more vigilant. This would be the best-case scenario. This is a guest post from Dr. Ian MacDonald, oceanographer at Florida State University and ECOGIG researcher. This article originally appeared online here. © ECOGIG 2011-2018. All rights reserved. Use of images or other content is strictly prohibited without express written permission. Any opinions, findings,fonts and conclusions or recommendations provided on this website are those of ECOGIG personnel and do not necessarily reflect the views of the member institutions or the agencies that fund our work.